Congratulations to the Rankin Cancer Run organizers, volunteers, participants and supporters for raising a remarkable $1 million on Saturday, May 27 for cancer care in Niagara. The 12th annual event, held in St. Catharines, attracted more than 13,000 participants, showing once again Niagara's strong community spirit. 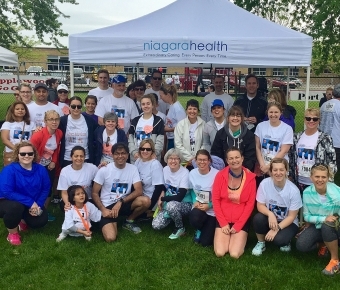 The Niagara Health Extraordinaires, featuring more than 100 members of our team, raised over $15,000 for the event. Our team was honoured to receive the Nancy O'Rourke "Courage and Heart" Memorial Trophy for being the top community team fundraiser. The Rankin Run is an important fundraiser for local cancer support organizations, including the Walker Family Cancer Centre and other services Niagara Health provides across the region. In its 12 years, the event has raised more than $7.5 million, which all stays in Niagara. Last year alone over $600,000 was donated to Niagara Health. We are extremely grateful for the funds we have received over the years as a result of this incredible event. We salute everyone involved for the event's continued success and the difference it is making in the lives of our patients.